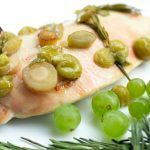 Roasting grapes really pull forward the sweetness of them, pairing perfectly with savory herbs and turkey breast. 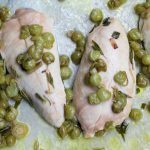 Making roasted grape turkey breast a quick and easy gourmet tasting dish! I always have the best-laid plans. I walk over to my local farmers market on Saturday mornings, with a pocket full of cash in small bills and my cloth bags ready. I listen to some music on my walk, and stop and smell the roses. Actual roses. It's amazing how different they smell from each other, and I am lucky enough to have many hanging conveniently over fences along my way. By the time I walk the 3 blocks to the market I'm inspired. I have my favorite vendors, and items I buy annually, monthly and weekly. White peaches from Harry, every year, as many as I can carry; this year he delivered 60 lbs. I buy “purse snacks” from Tracy at Great Bear Paleo Bites, once a month, no one likes me when I'm hang-ry! I pick up cilantro, every week; it sits proudly in a mason jar of water in my fridge and is a staple of everyday cooking. I buy small amounts of herbs, greens, and other great vegetables. Usually saving the big bulk buys from the farmer or fruit stand direct, as hauling 50 lbs of tomatoes home 3 blocks and up 2 flights of stairs is less than appealing. 2 reusable bags of fresh fruits and veggies seems like the magic amount that keeps me cooking and eating well all week. Sometimes… I get carried away, I end up with plastic bags or I find another bag in my pocket, and then I'm in trouble. My best intentions get carried away by inspiration and often the extra produce turns into beautiful compost. Occasionally there is a deal too good to pass up, and you end up doing things like zucchini everything. Or learning how to preserve kale (our kale chips are a great way to make bunches of it disappear). Or like these gorgeous seedless and organic grapes that were sooooooo delicious, even though I had too much already, I couldn't control my impulse to buy them. I ate grapes like candy until my tongue hurt. I froze a few to pop in my water bottle (or wine). But there they sat in my fridge slowly but surely losing their plumpness. I couldn't waste them, so what is a girl to do? I roasted them. 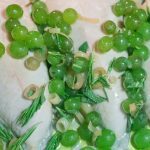 With a little salt and herbs, they were fantastic, extra sweet and decadent when paired with turkey breast, or pork, or other things that I haven't even tried yet!! 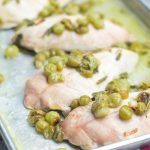 Roasted grape turkey breast, so easy, and so delicious! 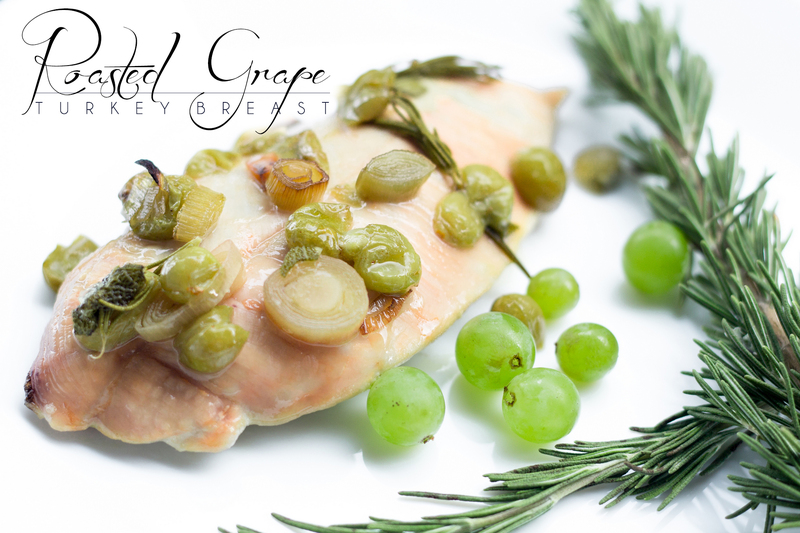 Sweet roasted grapes pair perfectly with savory turkey breast and fresh herbs. Making roasted grape turkey breast a gourmet tasting, easy dinner. Put the turkey breast on a pan with a lip (so the grapes don't roll off). 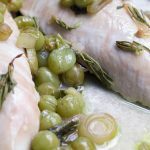 Drizzle 1 tbsp olive oil over the turkey breasts and put in the oven for 20 min. 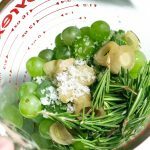 In a bowl, combine; stemmed grapes, olive oil, salt, and the fresh herbs roughly chopped. Set aside. Add grape mixture over top of the turkey breast and bake for 20 minutes. Increase heat to 425 F and bake for 10 more minutes. 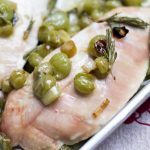 Roasted Grape Turkey Breast Author: Holley – www.ThePrimalDesire.com Sweet roasted grapes pair perfectly with savory turkey breast and fresh herbs. Making roasted grape turkey breast a gourmet tasting, easy dinner.